The Colt Commander, adopted in the 1950’s, was the first 1911 firearm manufactured in a caliber other than .45 ACP. 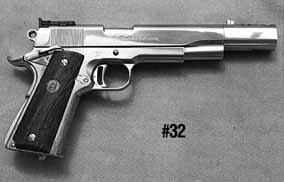 This specific example was chambered in .38 Super. Other Commanders were produced in .45 ACP and 9mm. This Commander is a highly modified pistol, likely designed for competition.